Except for the most hard-core birders, these are the “dog days” of summer. Things are a bit slow. There are birds to be found, but nothing like the variety of species we enjoy during the spring and fall migration seasons, when every day seems to bring a new surprise. But now is also a time of anticipation. Two of my favorite annual birding events are just days or weeks away. First, the appearance of migrating common nighthawks. Then, in September, the almost magical influx of ruby-throated hummingbirds. First let's talk about nighthawks. There is no better time than mid-August to mid-September to observe them, when large flocks are moving south toward their wintering grounds in South America. With a little patience, common nighthawks can be viewed from any backyard in DuPage County. The common nighthawk is easy to identify by sight as well. It's a dark, robin-sized bird with long pointy wings sporting white patches near the tips. Nighthawks are further distinguished by a floppy, erratic flight pattern as they feed on flying insects, their only food source. Given their diet, it's no surprise that nighthawks are not “hawks” at all. 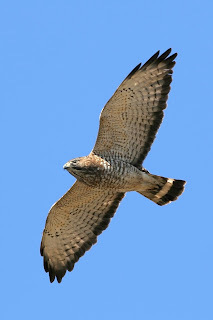 They belong to a family of birds called the nightjars, which includes the whip-poor-will. Nighthawks are most active around dusk or at daybreak, but every now and then you'll see one in broad daylight. They're also known to congregate near bright lights, just like moths. When I go to night baseball games I always watch for them. You have to be very lucky to ever see a nighthawk sitting still. Their coloration makes them virtually invisible when they roost during the day, typically on the ground or lengthwise on a branch. The timing for migrating nighthawks varies year to year. In 2007, I didn't see one until August 27. In 2006, August 15 was my first sighting. The species does breed in this region so spring and summer sightings do occur, but its not until later this month that we can observe them in numbers, sometimes in swirling flocks of 50 or more birds. Enjoy the show! Meanwhile, down on the ground, we are fast approaching the best time of year for attracting hummingbirds. Some of you may have been enjoying hummers throughout the summer. In my yard, however, the pattern has always been a few birds in May, none during the summer, and then lots in September. So be sure to have your sugar-water feeders up and ready by Labor Day. The volume of advice on how to attract hummingbirds is astounding. Entire books exist on the subject, which says a lot about how much people cherish these unique birds. In general, sugar-water should be viewed as a secondary food source; flowering gardens with lots of red, trumpet-shaped blooms are the best hummingbird magnet of all. Frankly, I've dropped the ball in terms of landscaping for hummingbirds. I rely instead on two feeders, placed about 20 feet apart. The dual-feeder strategy, which I applied last year for the first time, really does the trick. Hummingbirds are territorial, and some individual birds can be quite aggressive. So it's best to give them some space. Having multiple feeders can not only increase the activity level in your yard but also keep the birds coming back. If you're in the market for a feeder, I recommend a simple plastic model that's easy to fill and clean. My favorite is the HummZinger, which comes in several sizes. Get the smallest—it has just the right capacity to help minimize waste, since you'll need to replace the sugar-water at least once a week. The feeder is mostly red so hummingbirds are sure to notice it. There can never be too many hummingbirds outside my kitchen window. Maybe this month I'll invest in a third feeder. Finally, a mark-your-calendar item: On October 9, the DuPage Birding Club will welcome renowned nature author and artist Julie Zickefoose. She'll discuss and sign copies of her latest book, “Letters from Eden.” All are welcome. For more information, visit dupagebirding.org or call (630) 487-0323. I read a lot of bird books, and my all-time favorite is “Kingbird Highway” by Kenn Kaufman. It's the best birding adventure book I know. Even so, I'd never read it a second time until just before a family trip to South Dakota in June. I'm glad I did—for birders, Kaufman's memoir is the perfect read before hitting the open road. We left on June 8, the start of a 10-day trip that would cover 2,400 miles in a rented minivan. This was a family vacation, not a birding trip. But clearly there would be excellent chances to see some new species, as well as some western birds that I'd only seen once or twice before. Weeks before we left Glen Ellyn, I spent hours thumbing through my Sibley guide, dreaming of the possibilities. I also acquired a book on birds of the Black Hills, which naturally raised a my birding fever a few more degrees. The first notable birds occurred long before we reached South Dakota. Just after crossing the Mississippi River on I-90, we stopped at the Minnesota welcome center to stretch. Looking east toward La Crosse, I scanned the river for bald eagles and found one almost instantly. Moments later a black tern went coursing by. These would not be last “good birds” that I'd see while visiting rest areas on the trip. Lesson: Every pit stop is a birding opportunity! We reached the Badlands on our second day. Before entering the national park we stopped at a scenic overlook to drink in the strange and beautiful landscape. That would have been plenty, but some locally common birds made that little pause even better. A Swainson's hawk was soaring low right above us, and a lark bunting and singing western meadowlark perched on a fence close to the parking area. I was greatly impressed by the Badlands. The rock formations, the wildflowers, the big sky. Everything. We were greeted by a mountain bluebird at one of our first stops inside the park, and we'd be treated to many more of these powder-blue beauties. Say's phoebe, rock wren, white-throated swift, black-billed magpie, blue grosbeak, spotted towhee and lark sparrow were among other species I found inside the park. Nothing rare, but each one a treat. After the Badlands we pushed on to our rented cabin the Black Hills, near Deadwood. This would be a chance for some woodland birding, and I aimed to make the most of it with early morning walks before the family was up. The most colorful sighting was a western tanager, a bird I'd encountered only once before, in Arizona. Black-headed grosbeak, Cordilleran flycatcher and Townsend's solitaire were other highlights on the property. Our cabin was at the edge of a large open meadow, so from the porch it was easy to watch for soaring raptors. I twice spotted a golden eagle high in the sky, identifiable by its overall darkness and shape. This was one of my “target birds” for the trip, and I was to see another eagle at Wind Cave National Park in a few days. Another target was American dipper, a truly unique species and a local specialty in the Black Hills.That is, if you know where to look. The cabin owners, birders themselves, were glad to help. They directed me to the Spearfish Canyon, which happily was right on our way to Devil's Tower in Wyoming, a planned day trip. I found a single dipper in three different locations, the most famous being Roughlock Falls. This was a fun bird to watch as it dipped in and out of the quick-moving mountain streams. My next “lifer” was a total surprise. On our way to Rushmore one day we stopped at the gleaming visitor center for Black Hills National Forest. A pair of mountain bluebirds was nesting on site, and violet-green swallows were darting about. The center also featured some well-stocked bird feeders, and at one of them I quickly noticed an unfamiliar bird. A red crossbill! The olive-yellow female was soon joined by the more reddish male. Then a couple more females arrived. It was a great show, and completely unexpected. My best birding moment of the trip occurred at Custer State Park. I knew that three species of woodpeckers that I'd never seen were native in the Black Hills—Lewis's, three-toed and black-backed. Finding any one of them would take time and some luck. At Custer, I got my chance. Driving on the Wildlife Loop, we passed a forested hillside blackened by fire. It looked like perfect black-backed woodpecker habitat based on my pre-trip research. While my family patiently waited in the van—it was Father's Day, so they were in a compliant mood—I began hiking up the hillside. There was almost no undergrowth, just pine needles, so the walking was easy. I soon heard a drumming sound but the source turned out to be a hairy woodpecker. Then I heard more drumming, close but from a different direction. Obviously I was in the right place for woodpeckers! Moments later, a black-backed revealed itself. I watched as it moved from tree to tree, keeping its distance but still allowing me good views. Mission completed, I practically flew back down the hill to the van. Nothing beats the feeling of finding a special bird completely on your own. I'd been dreading the two-day drive back to Glen Ellyn but the first day was a lot more tolerable thanks to some interesting roadside attractions. No, not Wall Drug or the Corn Palace. This is about birds, remember? One especially nice rest area, on the east bank of the Missouri River, featured a short nature trail where I found singing dickcissels, a grassland species. That was a new “trip bird,” as was the long-billed curlew that flew low over the highway about an hour later. I don't keep a list of birds spotted from a moving vehicle, honest, but the curlew made me think about starting one. There were lots of little ponds or “potholes” along I-90, and many of them held waterfowl. The urge to pull over and have a closer look was strong but that would have been dangerous. Thankfully, even at 70 mph it was easy to enjoy the yellow-headed blackbirds in the cattail stands. They are spectacular birds, larger than their red-winged cousins. To compare my trip to Kenn Kaufman's 1973 odyssey would be preposterous. For an entire year, at age 17, he hitchhiked around the country on a shoestring budget. We drove to South Dakota in a minivan and spent freely. But I do relate easily to Kaufman's desire to see new birds in new habitats. That desire makes every trip a little more interesting, no matter how you choose to travel. Last Friday an earthquake woke me up. Then a bird rocked my world. The quake that all Chicago was talking about occurred at 4:36 a.m. and measured 5.2 on the Richter scale. That's a big one, and it really did interrupt my slumber. But what really gave me a jolt was the Prothonotary Warbler that visited my yard a few hours later. It was a first for my Yard List, species No. 105, and quite possibly the best. Bright, unmistakable and so unexpected. It was all of these things. It was also my first warbler of the spring. What a start! Funny, the day before, a Prothonotary Warbler was reported at Lyman Woods on IBET, the birding list-serve. I remember seeing that post and thinking I might go over to Lyman on Friday and try to see it. It would only be a 5-mile drive. Turns out the bird came to me. To say the least, Prothonotary Warbler is not a bird I ever expected to see in the yard. They like stagnant water and swamps. That's the habitat where I saw my first Prothonotary--in Tampa, in 1998. It would be five years before I saw my second, at Kiawah Island, S.C. But during migration, birds turn up in odd places. Almost anything is possible. I saw the bird immediately as I stepped into the backyard to begin my daily spring ritual of scattering millet and cracked corn for the birds. There, climbing on the fence vines about 40 feet away was a glowing yellow bird. Not a goldfinch, I knew that. But my binoculars were inside! I dashed in the house and quickly focused my bins on the fence, looking through the sliding door in our kitchen. The bird was still there, practically posing. That's when I knew for sure, a Prothonotary! I hustled back outside and enjoyed a few more good looks from even closer range. It's quite possible that I was still in shock at that point. How else to explain my next move? I raced upstairs to alert my wife about the bird. Two problems. One, she was still asleep. Two, she's not a birder. But hey, we're talking about a Prothonotary Warbler here! Maybe the only time one will ever visit the yard! Sensing the urgency--or more likely, just humoring me--Catherine climbed out of the sack and stumbled over to the bathroom window that overlooks our backyard. But too late, the warbler was out of sight. Oh well, there will be other chances. Just not in this lifetime. I went back downstairs and looked again but no luck. But that was okay, I'd had enough luck already. Then I started thinking. Where was the bird now? Did anyone else in the neighborhood see it and appreciate it? Where would the bird be at the end of the day? Oh, and did it feel the earthquake, too? Another question I had was off the wall: When an unusual bird like this comes around, do the other birds notice? My 7-year-old son and I answered that question with another: How could they not? To a House Sparrow, for example, a Prothonotary Warbler would almost certainly be a new and unusual sight. It doesn't matter, of course. The warbler was just living its life, and that morning I was living mine in exactly the right place at the right time. I subscribe to a free e-mail list for birders--a place where fanatics like me can post their bird sightings and share information. One person wrote to the group looking for advice. She was a beginning birder who claimed to have seen all the common birds in her backyard and neighborhood and wanted to know how to expand her "life list." One response, from a birder in Palatine, suggested that she “Join the local bird clubs and go on all their field trips.” Great answer, I thought. There is no doubt that joining a club opens up opportunities to see more birds. The outings focus on local “hot spots,” and the leaders are usually experts who can identify virtually any bird by sight or sound. Plus, you’ll generally see a greater variety of species when birding in a small group simply because more people are looking and listening. We are fortunate to have two excellent birdwatching clubs in this area: the DuPage Birding Club and the Kane County Audubon Society. Joining either one would be a great way to take your interest in birds to the next level. Members of these clubs range from beginners to highly advanced birders. Some watch birds primarily in their backyards; some have birded all over the world. But the wide range of experience and skill levels is not a problem. Most birders, I’ve found, are friendly and helpful--another reason why this hobby is so easy to enter. The expert birders seem to really enjoy the teaching role. In the field, they go out of their way to help beginners see and identify the birds. When I moved to Glen Ellyn 10 years ago I knew nothing about the local bird scene. The DuPage Birding Club was just what I needed. The club’s meetings, guest speakers, newsletter and field trips brought me up to speed quickly. Without the club, I may have never have participated in the Christmas Bird Count, gone on a woodcock watch or “discovered” some of this area’s best birding sites. There’s something very motivating about these clubs--they'll get you out and about, to places you might never go on your own. The DuPage Birding Club was founded in 1985 and has more than 200 members. Meetings are held at the IIT Rice Center campus in Wheaton. For more information, visit www.dupagebirding.org. To receive a sample newsletter, call 630-887-7951 or e-mail yadempsey@birches.net. Kane County Audubon began in 1966 and has about 110 members. Most meetings take place at Peck Farm in Geneva. For more information, go to www.kanecountyaudubon.org. You can also call 630-584-8386 or e-mail randrini@aol.com. With either club, you needn’t be a member to attend a meeting or field trip--guests are always welcome. Even if you participate in a small fraction of a club’s activities, you’re bound to meet some nice people who share your passion for birds. That’s the greatest club benefit of all. T.S. Eliot called April “the cruelest month.” I guess he wasn’t a birder. I love this time of year. The days are getting longer and that means more time to watch birds. Best of all, there’s more to see! Look carefully and you may spot some interesting birds right in your backyard—migrating species that we haven’t seen since fall, or maybe since April of 2007. Let’s start with the kinglets—golden-crowned and ruby-crowned. These tiny, aptly named birds seem propelled by nervous energy. They’re always in motion, flicking their wings and sometimes hovering as they feed. Golden-crowns appear in our region first, and of the two kinglet species these tend to be the least common in my yard. Some Aprils I don’t see them at all. By mid-month they are gone, off to their North Woods breeding grounds. Ruby-crowned kinglets are on a slightly later schedule. They arrive in mid-April and often stay into early May. It’s always a challenge to see the male’s scarlet tuft, which is usually concealed. There are many more April specialties to watch for. Some, like the kinglets, are just passing through. See them now or your next good chance will be in the fall. Fox sparrow, winter wren, brown creeper, hermit thrush and yellow-bellied sapsucker, for instance. My yard records include about a dozen one-time sightings, and two of them—blue-gray gnatcatcher and Eastern towhee—are generally April-arriving species. Although these birds nest in our region, this month may be the best opportunity to spot them in backyard habitats. Gnatcatchers like to forage high in trees, moving about quickly like the kinglets. Their white eye-rings and extra-long tails are distinctive. Seeing these features on distant birds can be tough, but at least in April the trees are still mostly bare. Something else in our favor is that the seasonal gnatcatcher population is said to be growing in the Midwest. Towhees are large members of the sparrow family, which explains why they’re normally seen on the ground scratching for food. The one that visited my yard, a male, was in the grass below my feeders. That was surprising since towhees are typically more secretive. This one wasn’t shy at all, and even performed its sweet “drink your tea” song. To see even more April species, be sure to take a few walks in the parks and forest preserves. A birding hot spot on my agenda is Nelson Lake Marsh in Batavia. A flock of migrating American white pelicans has visited the Kane County preserve in early April for the past five years. Hopefully, this will make six. Finally, while nothing beats actual birding, one of my favorite April rituals is to pop “Watching Warblers” into the VCR. It’s a beautifully made film that documents by video and sound all 39 warbler species in the Eastern United States. I can’t think of a better way to prepare for the color and excitement that awaits us in May, when spring migration reaches its peak. The warblers are coming, and so are Baltimore orioles, scarlet tanagers and indigo buntings. Come to think of it, that’s another thing I like about April—the anticipation. The birding is great now, but the best is yet to come. OK, it wasn't really purple. Not literally. In fact, it was a Little Brown Job. Fortunately, I looked a little closer at the bird perched on my black-oil sunflower tube feeder on February 9. Behold, a Purple Finch! It was a female, making it quite easy to identify. Purple Finch is a species where the female is more obvious than the male. Usually it's the other way around. The brown and cream-colored head pattern was unmistakable, and not seen in my backyard since October 2005. That was the only other time a Purple Finch (two or three females as I recall) came to visit. I look forward to when a male finally shows up, and when it does I'll make sure it's not just a House Finch. The two can be confused, but the Purple Finch male lacks streaking on the flanks and its head and breast color is more raspberry than the red-orange sported by the House. It's a handsome bird. When I saw the female last month I knew instantly it was a Second Sighting for the yard. Second Sightings are special. They make the Yard List, Life List or any other list a little richer. And no doubt, Second Sightings are sometimes more satisfying than the first. I thought of this recently when I settled the score with an old nemesis species, the Common Redpoll. My first redpoll sighting occurred at Fermilab in 1999. Talk about a frustrating lifer. There were three birds, and by the time I got my binocs on them they were gone. At most I enjoyed a two-second peak, and our group never relocated the birds. I had really hoped to see a redpoll at my thistle feeder this winter, which would have been a first. Lots of other birders have reported them, so it's clearly been a good year for this species in our region. Many years, redpolls are virtually impossible to find around here. Not wanting to let a good opportunity get away, I went looking for redpolls at Springbrook Golf Course in Naperville on February 23. I'd heard through friends in the DuPage Birding Club that redpolls have been regular visitors this winter to the thistle feeders hanging by the maintenance shed, just off 83rd Street near Book Road. Pulling into the driveway, the first thing I noticed was male Ring-Necked Pheasant. How could I not? What a striking bird. He'd probably been cleaning up spilled seed under the feeders. Without even leaving the car, I then focused on the large hanging thistle sacks. Within moments, I saw them--Common Redpolls coming and going, unconcerned by my presence. Because of that day at Fermi, this wasn't a "lifer," but it sure felt like one. I watched the redpolls for 10 minutes or so from different angles, savoring my Second Sighting of this often elusive winter finch. A high-quality Second Sighting can be a worthy goal. You probably know without checking some of the birds you've only seen once. Think especially about species you've seen but not seen well, or have not seen for many years. Then get busy and track them down. Spring is a great season for treasure hunting. When I woke up on January 9th I had never once seen a Long-Eared Owl. By noon I'd seen eight, all but one in the same tree! Starting off a new year with an easy "lifer" is great. It happened in 2007, too, when I spotted the pair of Harlequin Ducks that lingered for at least six weeks near Chicago's North Avenue Beach. The roosting Long-Eared Owls also were "downtown birds," and that's what made them a big story—for birders and the general public alike. Chicago's major newspapers and several TV stations provided coverage, a few employing all-too-predictable phrases like "birdwatchers are flocking" and "giving a hoot." But that was OK. It really was a remarkable natural event and I, for one, was happy to see it play out in such a public manner. A lot of people were able to see their first owl of any kind in the wild, and right in the city! A nice side story is that the occasion afforded a terrific teaching opportunity. That's because the roost site was in a park next to a South Loop elementary school. Easy to observe owls, just outside the classroom—what could be better? For me it was a simple matter of jumping on a bus during lunch hour. I left my office at Tribune Tower at 11:30 and was back in exactly 60 minutes. Even the CTA worked in my favor that day! It was a noon-time owl prowl that I'll never forget. Later in January I had another owl encounter and a teaching opportunity of my own. This time the event was in my own backyard, thanks to a visiting Great-Horned Owl. I was outside filling the feeders about 6:15 when I heard the unmistakable hoots. It really surprised me because I'd never heard an owl so early in the evening—two or three in the morning is more typical. So without wasting another second I ran through the garage and swung open the door to the kitchen, calling for Rachel (age 12) and Jay (7) to put on their coats and boots. The kids mobilized quickly, trusting that my own state of excitement signified something worthy of their efforts. Back outside, the owl was still calling, and from pretty close range. I suggested that we listen for a minute or two before attempting to actually see the bird. Then, after creeping to the back corner of the yard, I spotted the bird at the top of a tall pine, about one lot over. A second later, the big owl lifted off. Jay was at my side and got a quick glimpse. Rachel didn't see the bird but hearing it was all that really mattered. She and her little brother really seemed pleased by the experience, which lasted all of five minutes. Or were they were just humoring their "bird man" father? Nah. So for me, January was mostly about owls. But one other highlight this winter has been the Hermit Thrush that I mentioned in my previous post. This winter rarity continues to drink from the heated birdbath, and that's all the motivation I need to keep cleaning and filling the saucer every day, no matter what the weather conditions. It makes me feel needed. Truth is, the thrush and all the other birds give me a lot more than I give them. The backyard birding year could not have ended any better for me. On the last day of 2007, a small flock of Pine Siskins appeared at my thistle tube feeder—an event I'd been waiting for since early November. They were my first “yard siskins” in four years, and they pushed my annual species count to 88. My best previous yard year was 79 species in 2005. I'll be trying, but I can't imagine topping 88 species in 2008. I had more than my fair share of birding luck in 2007, with the New Year's Eve siskins perhaps the best case in point. Five or six birds came to the thistle around noon, when I just happened to be in the kitchen. Looking out, my first thought was goldfinches. But they seemed a little larger, and then I noticed the streaking. So even before I reached my binoculars on the other side of the room, I knew this was a special moment. I enjoyed a nice long look at these uncommon yard visitors, fully appreciating my good fortune. They stayed for about 15 minutes and I didn't see them the rest of the day. Now it's the first day of 2008, and a new annual yard list begins. The first entry: White-Breasted Nuthatch, heard and then seen while I was outside shoveling snow. Not a bad First Bird. Certainly better than starting the year with a House Sparrow. My third bird of 2008, following a Downy Woodpecker, was a Hermit Thrush—undoubtedly the same bird that for several weeks now has been visiting our heated bird bath. He flies in, takes a few sips and then flies away. I'm hoping the bird stays around all winter. According to Sibley, southern Illinois is about as far north as you could expect to see a Hermit Thrush this time of year. So “my” bird is a bit out of range, and it's the first Hermit Thrush to visit my yard in the dead of winter. Clearly the fresh water source is what's keeping him here. Maintaining a bird bath in winter takes a little effort, but times like these really make it worthwhile. Plus, all the backyard birds will use it. They need water, and a heated bird bath can be every bit as attractive to wild birds in winter as a well-stocked feeder.